Sunday, those hill climb crazies return to the AMA Class A National event at the White Rose MC's facility near Spring Grove/Jefferson, PA. I've attended this event a few times and hope to this Sunday. If you've never watched a real hill climb, you should. 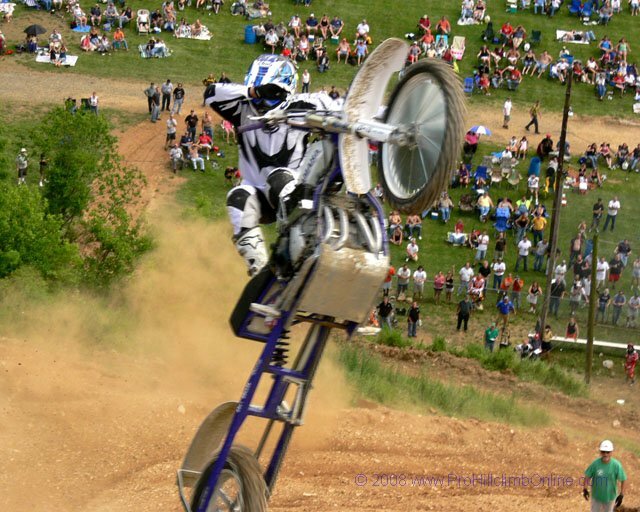 It's one of the oldest forms of motorcycling competition, and also one of the toughest...and most basic: fastest to the top wins (or furthest, if the hill beats everyone), which often leads to all manner of entertaining havoc. At the White Rose hill, riders launch against a 300-foot dirt hill; two jumps on the way up make it even more interesting. Anyone lucky and fast enough to cross the finish line with momentum to spare often takes a final giant leap over the crest, which can lead to moments like this one. Bikes range from converted MXers to purpose-built climbers powered by old British twins or late-model 4-cylinder screamers running either nitro or NO2. That the club can be reached via twisty back roads makes attending the event that much more fun! The first rider launches at 12:30, rain or shine. More event info on the White Rose MC site..